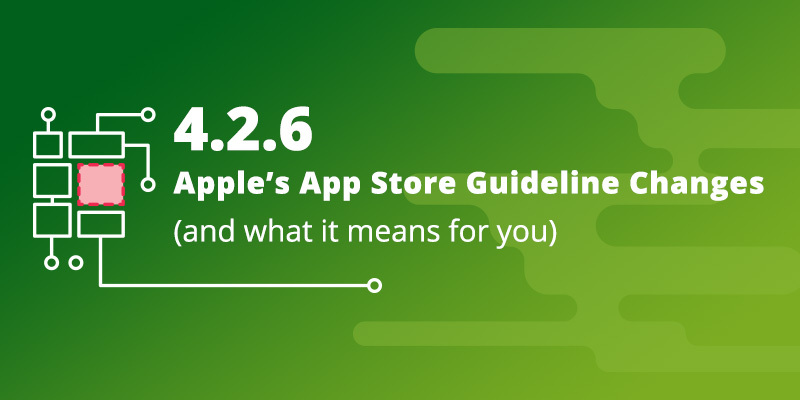 4.2.6 App Store Guideline Changes - What Does It Mean for You? Update: for the latest on Apple’s submission procedures, check out this article on the knowledge base. There’s been an awful lot of talk over the past few months within the app community around the new change to Apple’s App Store guidelines made on 8th June 2017, and specifically, rule 4.2.6 which states that “Apps created from a commercialized template or app generation service will be rejected.” The guideline by Apple was added in order to minimise the number of app submissions to their App Store that are deemed to be of minimal functionality, considered spammy or are copycats. Whilst this change is intended to keep Apple’s App Store clear of apps that are straightforward copies of one another, with little individuality – an unfortunate side effect has been the increase in difficulty to get new apps submitted through the templated app builders like the AppInstitute platform. Despite this update from Apple causing some disruption to the app development community and other templated app builder software providers, it’s important to know that variations of these Apple guidelines have already been in place for a long time, and is simply a way for Apple to ensure their App Store offers value to their customers in terms of native device functionality. For the last 12 months, our technical team have been working on developing a new distribution platform for our apps and are excited to announce the launch of our Progressive Web Apps which has coincided with the recent change in Apple’s guidelines. PWAs combine the functionality of native apps with the instant reach of the web, using the latest in browser technology to remove the friction caused by the App Stores, in terms of submission time and user experience. Widely considered by industry experts, PWAs are deemed to be the future of the mobile platform, offering a best of both worlds alternative to mobile websites and native apps. Ultimately, we had already recognised the huge potential of PWAs and the huge business benefits they offered to SMEs looking to maximise their mobile marketing strategies. A project heavily backed by Google, they were first used in 2015 and have seen massive success with companies like Twitter who released a “lite” version of their native app for users with data restrictions and limited access to the internet. Because PWAs use your smartphone’s browser, it means there no need to distribute your app via an App Store and can be used across any device, including Blackberry, Windows, Android and iOS to a Tablet. PWA case studies from Google reveal statistics taken from early adopters, with results including faster loading times and up to 25X less data usage. We’ve been working very closely with Apple to ensure all existing customers with an iOS app from AppInstitute will NOT be affected. Apple has agreed that all our existing iOS apps will remain on the App Store and will be able to continue to receive updates as usual. Whilst the process of submitting apps successfully has gotten harder – it’s not impossible. For those who want to get their app on the Apple App Store – AppInstitute are still able to offer our AppBuilder Pro+ plan which includes a professional app review and submission service. The Apple App Store review service aims to maximise the chance of approval, with our experienced team of app builders working with your app to take all the necessary precautions to work towards making your app live. It’s important to note whilst we cannot guarantee approval, that payment of the review service will only occur upon successful submission to the App Store. Excited about the future of mobile? Progressive web apps are an exciting new technology and we are delighted to be at the forefront of this growing market, offering PWA solutions to SMEs with our simple drag and drop app builder platform. As a technologically forward thinking company, we are used to innovating, thinking outside of the box and being agile in terms of how we invest our resources to create new opportunities and the best solutions for our customers and businesses. PWAs were a natural evolution to how we foresaw the way mobile was headed. Learn more about progressive web apps here.